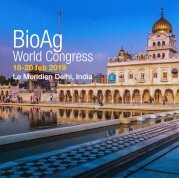 Stop by the annual BioAG World Congress from the 18th-20th of February located in Le Meridien Delhi, India. At this event, Tradecorp will be a Gold Sponsor, and will be hosting a pre-event networking cocktail after the registration process. In addition, visit Tradecorp’s interactive stand. Here, visitors will be able to consult with experienced technicians about solutions to better their crop yield and quality. Furthermore, Camila Levy, R&D Agronomical Manager at Tradecorp, will be a Keynote speaker at the Congress, where she will deliver an informative speech about Biostimulants the 19th of february. Her presentation, “A vision for the future: A Biostimulant revolution: Managing abiotic stress impacts on crop yield and quality,” and will explore innovations in the sector such as the use of amino acids and seaweed extracts. Camila will also touch on the new application process that these products entail along with what that the future holds for the biostimulant sector. The BioAG World Congress is “An event by the industry, for the industry,” bringing together the most important companies and stakeholders of the Bio-Agro world. Attendees will be able to engage in networking to discuss the opportunities and challenges facing the industry. They will also be able to sit on over 30 key note speakers who will share their innovations and insights.